I’ve mentioned before that I’m not exactly naturally crafty. But while I wasn’t born with the "craft gene", I am in complete and total awe of those that were. Take for example lovely cousin Erin. The day after Audrey and I took on Martha, Erin arrived at our house for Sunday dinner armed with visions of Esthex’s sweet toys + a slew of felt, ribbon and fabric, her sewing machine (!) and a picture of a unicorn that Audrey had drawn the previous week-end when she and Erin had a dinner date. We were going to make a softie! Oh how cute. They'll make you a custom monster at FAO too, but it's a lot more expensive than free. ;) Very lucky girl and a very sweet cousin you have. It seems that Audrey has a creative mind too....She must be fun to watch grow up! especially the part about the thai take-away and glasses of wine. plus, it's always a perfect post when little a is in it. Adorable!!! 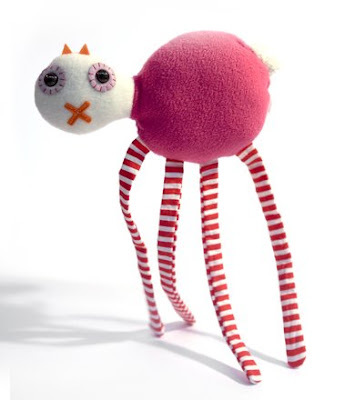 Reminds me of the "Ugly dolls" - anyone seen those? Just as cute, except they manage to get away with charging $30+ each!!! that is so cute!! what a nice erin!